It's been a long time since I wore a slogan t-shirt... In fact, I think the last one I wore may have been a Tammy Girl special announcing me as a 'Tom Girl'. If you don't remember Tammy Girl, you've just made me feel really old, but you're the one at a loss, because you seriously missed out on some statement fashion pieces in the 90's! 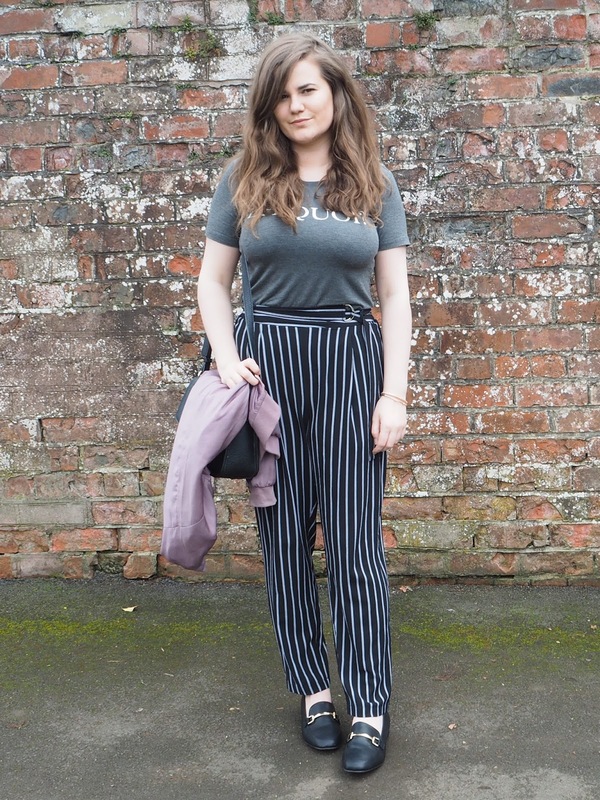 Today's slogan see has become quite a staple in my Winter to Spring wardrobe, it's a great layering option and it's grey, which already means I love it loads. This one is emblazoned with the slogan 'EH QUOI?' which translates to OH WHY? No, no, no. All boring topics, all boring titles and then it hit me. Something I've been wanting to discuss for a while; Oh Why Is The Internet Life Such a Lie?! Of course we only want to share the best photos of ourselves, there are plenty of half blinks that make me look drunk and windswept hair shots that go straight in the trash, does this make me a fake? I don't think so, in fact I'm pretty sure every other blogger does the same and every other person does it on their own social media, it only makes us human. But where does this portrayal of perfection stop? I like to think of myself as an honest person, I want to start discussing some more taboo subjects and covering topics that people sometimes shy away from. 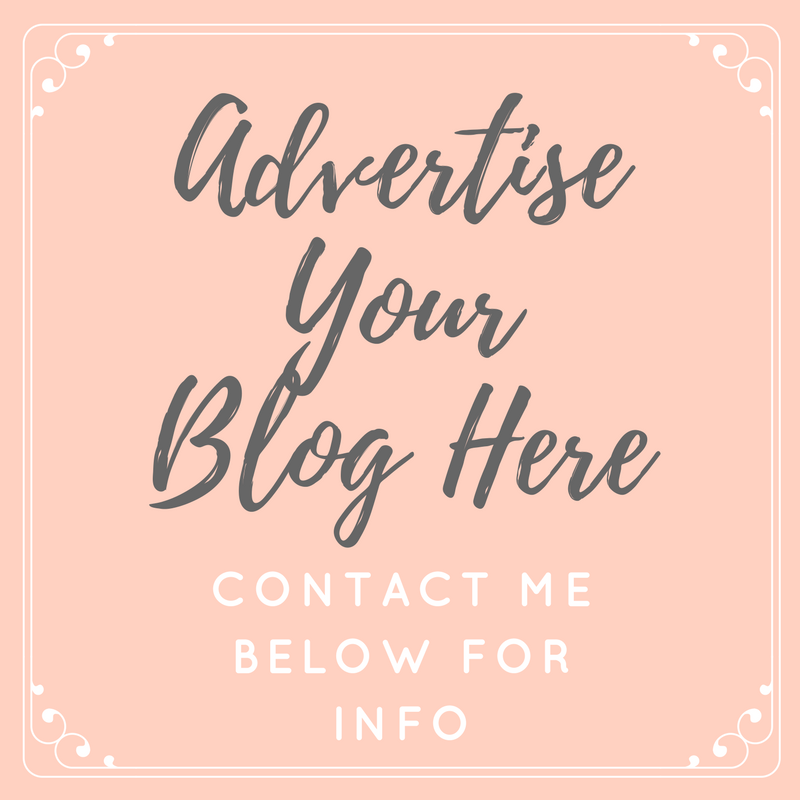 I don't think many conversations should be hidden from the internet, I want to use my blog to the best of it's ability and if I'm going to say something that will help even one person, then that's good enough for me. I've been honest on my blog since day one. I've never spoken about a product I hated and told you all it's amazing, I've never accepted payment to promote products I am allergic to or just don't like and I've even given negative reviews (something which I think is still too rare in the blogosphere). In real life, I'm quite reserved, I'm quiet, I can come across as shy and I'm definitely more of a listener than a talker. I do worry that people may read my blog or watch my videos and then meet me and think I'm not the same person. I'm always me, I think the me in my videos is how I am with my friends and people I know, I'm just better when I've known someone a while, rather than initially. I hope that makes sense. When it comes to talking about my life, rather than beauty products and clothes, I find it easier to share the good, rather than the bad and the ugly. And trust me when I say, there has been plenty of bad and ugly over the last four months. I could write endless posts with clickbait titles telling you all about the terrible time I've had, and you really can't imagine the half of it. I could name and shame, I could tell all... but for now, I'm not going to. I prefer to keep things as light and airy when it comes to real life situations. Looking from this perspective, this got me thinking, is the internet life really a lie? And I kind of think it is. We follow blogs, watch videos and read tweets from all sorts of people around the world. Some of my favourite bloggers and vloggers appear to share their whole life online, which I love and admire, but are they really sharing everything? I don't think we really know anyone properly, everyone must have something to hide, or something they don't want to share with the world. All that is shared is the ideal, the highlights and the good points. Take Instagram for example... If only everyone's Insta feed was a true portrayal of day to day life, we'd all be living the dream! I find the only areas of social media where real life pokes its nose in now and again is through Snapchat and Insta stories... You see the odd no makeup face, scruffy top knot and rant on there, but of course, these are only temporary. After thinking all of this through, I'm going to make an attempt to have my internet life as more real, more true and always honest. I'm going to start vlogging again, something I was loving until the end of last year. I'm definitely feeling in the right place to start that again, I will however be keeping some things to myself. I'd love to hear your thoughts on this... Do I have a point, or am I just rambling?! 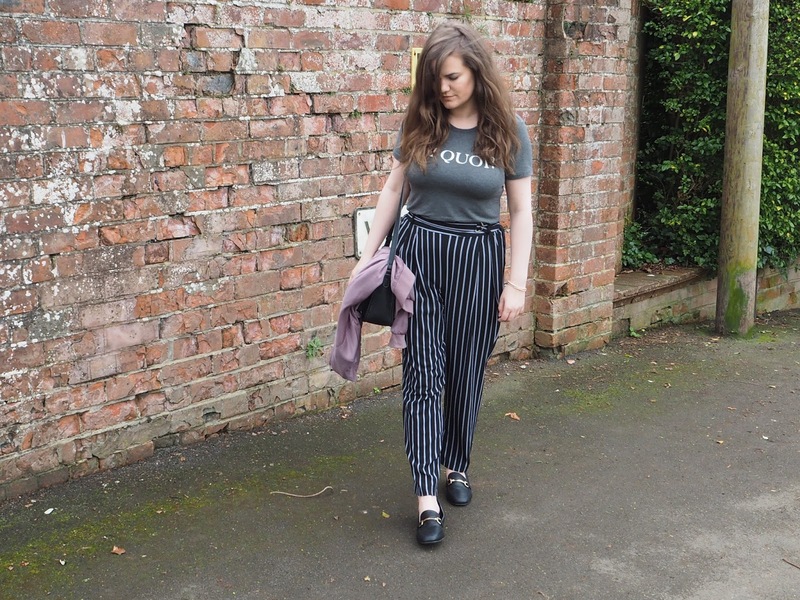 While we're on the subject of faking it, I made a comment on my Instagram about how these trousers make my legs look so much longer than they actually are, and it started a little conversation about how tall people perceive you to be when they only know you through your blog! It's such a weird thing to think about... How tall do you see me as? I'm actually 5ft 4". 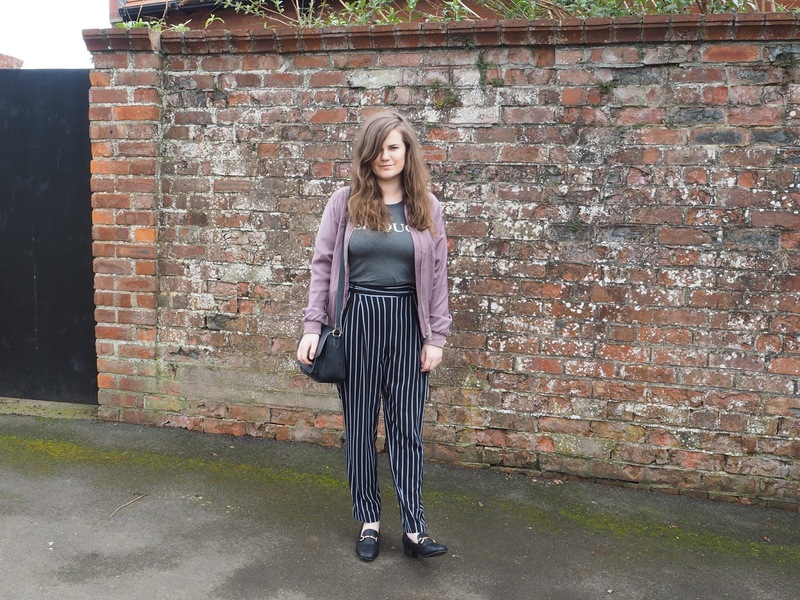 These trousers are amazing though, they were a bit of an impulse buy, but I keep reaching for them... They can really smarten up a totally casual look. I had to jump on the Primark shoe bandwagon too, but at only £5, who wouldn't?! I can relate on so many levels to this post. I think you're right, you never know what you're getting with someone's online profile, Instagram, their blog, you name it. They could be giving you every thing, or they might only be telling you a snippet of what's happening in their life. It's mad! I'm the same, quite often when people first meet me they think I'm really shy and quiet, but after a while I do open up! I think that's a bit of a tricky area to deal with online, you almost have to find a balance. I can completely relate to what you're saying - you're definitely not just rambling trust me. I always wonder how I come across too and quite surprised we're both the same height. I always assumed you'd be taller before meeting you and I don't know why! You come across as such a genuine, lovely lady though both online and offline.